Addition of Multi-Slice CAT Scan! We are pleased to announce the installation of our new multi-slice CAT (CT) Scanner. 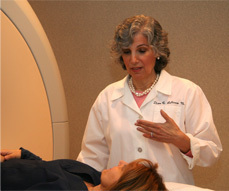 This is in addition to our new high field MRI and our existing open MRI. Should your doctor advise that you need a CAT (CT) scan of your head, neck, abdomen, pelvis, bone, spine or any joint, please avail yourself of our new technology. This new CT offers increased speed of exam, lower dose and diagnostic precision. Our new CAT Scanner is also ACR accredited; adding this modality to our other ACR accredited modalities mammography, ultrasound, stereotactic breast biopsy, ultrasound core breast biopsy, and MRI. We also have a new computer program that allows your doctor to securely view your digital exam images and read your diagnostic report on-line, providing your doctor with an efficient method of accessing the details of the exam that you have had with us.